This is our home grown version…featuring Music! Costumes! Food! Revellry! Bringing a taste of New Orleans to Dartmoor. Facebook Event here: join, share, invite your friends! Assemble at Ashburton Arts Centre. Wear: fancy dress, masks or come as you are. Anything goes! Bring: lanterns* , torches – or enjoy the light of the person standing next to you. *NB we will be making lanterns using real flame tea lights that we will secure inside the lamps. If you would prefer to use LED tea lights or battery operated fairy lights, please bring these with you. Parade down Kingsbridge Lane and up Mill Meadow and back down Cleder Place. 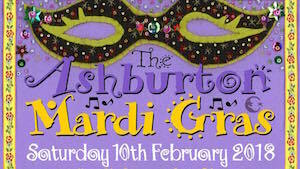 We will be parading to a real Samba Band! Mardi Gras Bar will be open. Families are welcome to stay and enjoy some food and drink in the Bar and Kitchen ‘Blue Room’ until 9pm. Tickets available for anyone wishing to enjoy the evening event in the main hall, featuring the sounds of the ever-uplifting Rambunctious Social Club and the fabulously swinging South Devon Big Band. We’re transforming the Town Hall to bring the laid back good times party vibe of Louisiana to our small town this chilly February. Head on down and get hot! £10 adults, children free. Buy in advance at Churches or on the door. 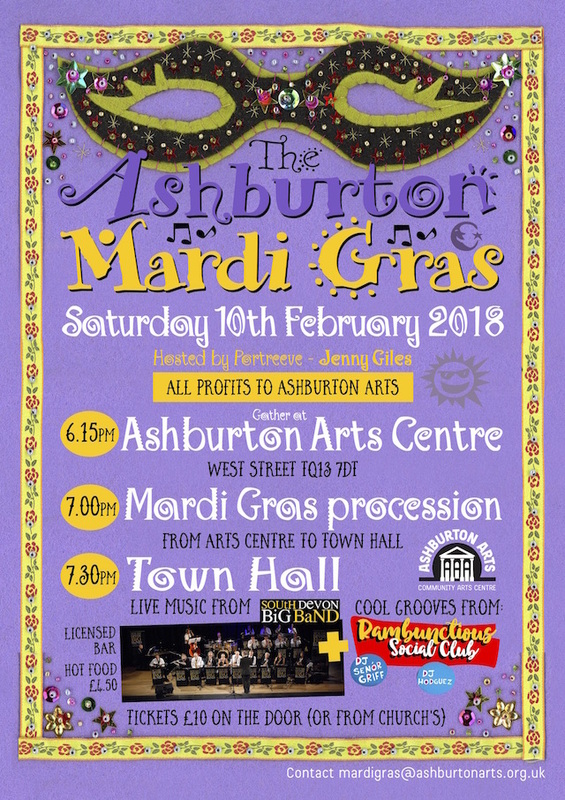 Mardi Gras Workshops at the Arts Centre on 3 & 4 February: Samba Band, New Orleans Street Band, Swing Dance, Lantern & Mask-making. Click here for details.